ABOVE: Java Island in Amsterdam. Reserve a double room or a four-person suite in a restored 19th Century townhouse. Breakfast is included in the rates, which are comparable to what you'd pay in a good mid-priced hotel. This Web site has listings and photos for several dozen B&Bs. 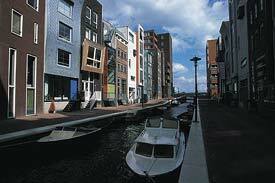 The owner also has apartment-rental listings on a separate site, along with B&B directories for Rotterdam and The Hague. Photo copyright © Amsterdam Tourist Board.